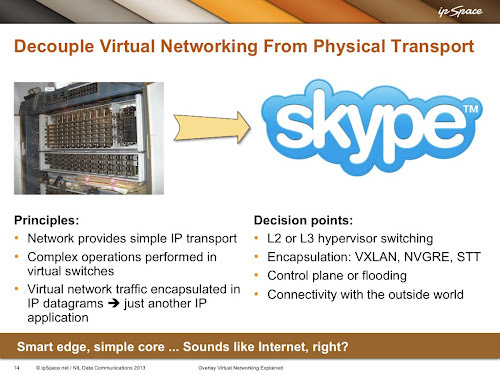 With the recent plethora of overlay networking startups and Cisco Live Dynamic Fabric Architecture announcements it’s time to revisit a blog post I wrote a bit more than a year ago, comparing virtual networks and voice technologies. 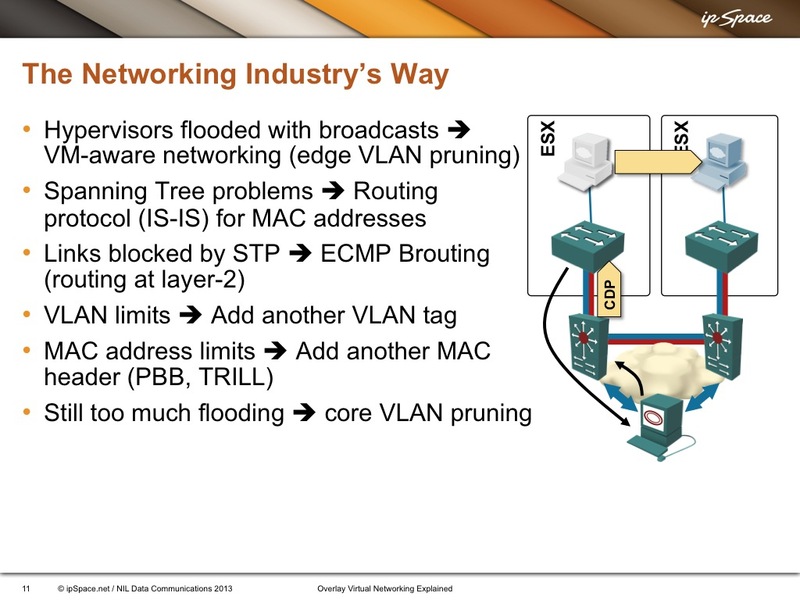 They say a picture is worth a thousand words – here are a few slides from my Interop 2013 Overlay Virtual Networking Explained presentation. This is how most enterprise data centers provision virtual networks these days (if you’re working for a cloud provider and still doing something similar, run away as fast as you can). Good morning! To which VLAN would you like to connect today? Which VLAN would you like to dial today? 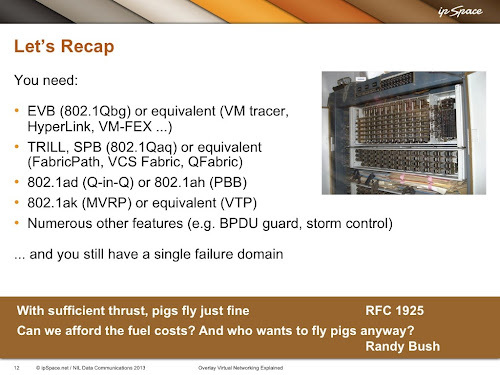 With the edge being mostly stupid (and 802.1Qbg playing the role of rotary dialing), you need loads of technologies in the network to compensate for the edge stupidity, just like the voice exchanges needed more and more complex technologies and protocols to establish voice circuits. The details have changed a bit (Cisco seems to be embracing L3 forwarding at the ToR switches), but the architectural options haven’t – you have to have the complex stuff somewhere and it will be either in the end systems (hypervisors) or in the network. We all know how the voice saga ended – you can’t sell a mobile phone if it doesn’t support Skype, and while there are still plenty of loose ends when you have to connect the old and the new worlds, more or less everyone essentially gave up and started using VoIP for new deployments. Yes, it took us more than a decade to get there, and the road was bumpy, but I don’t think you could persuade anyone to invest money in a PBX-with-SS7 startup these days. We’ll probably see the same game played out twenty years later in the virtual networking space (one can only hope the remains of the past won’t hinder us as long as they are in the VoIP world) – the established networking vendors selling us smarter and smarter exchanges (switches) and the virtualization vendors and startups selling us end-system solutions running on top of IP. It’s easy to predict the final outcome; it’s just the question of how long it will take to get there (and don’t forget that Alcatel, Lucent and Nortel made plenty of money selling PBXes to legacy enterprises while Cisco and others tried to boost low VoIP adoption). While I probably have more bias than most, I 100% agree with you here Ivan. I was discussing it the other day with someone and the lack of real innovation over the past 10 years seems like it will flood in. And if history is accurate, we will still have lots of people wondering where their buggy whip orders went. Great post and perfect analogy. But i think we need another small distinction between the technologies/features reinforcing the UNDERLYING network, be it routing or birding, and other promoting the underlying network. Where’s the Revolutionary Networking Innovation?